Dystopias fit the Zeitgeist of the twenty-first century a little too well. The level of disillusionment has soared since the administration of Bush the Less when an unprecedented degree of ridiculousness tempered every political decision filtering out of a Washington that has become a little too religious. So it is that the genre of the dystopia is strangely therapeutic. I first became aware of Margaret Atwood because of an introduction to the Bible that pointed out the misuse of Holy Writ in her classic The Handmaid’s Tale. An allegory that demonstrates the power of religion to reduce women to mere reproductive objects is frightening enough in itself, let alone the post-optimistic view of a future of endless possibilities gone bad. Now that I’ve finished her more recent Oryx and Crake, I see that her outlook has grown more bleak, if more believable. 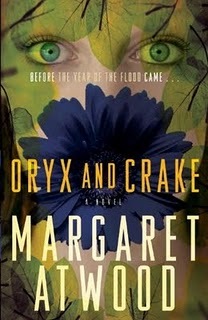 Like most dystopias, Oryx and Crake is filled with religious and biblical allusions. A society that does not know its Bible is easily manipulated by it. The book has been out long enough that I won’t worry about spoilers – does any dystopia end well? The basic idea is that the eponymous Crake of the title has tried to replicate Eden with genetically improved human beings. To prevent them from entering a world filled with human-inflicted suffering, he devises a way to wipe out the world’s population, leaving these innocents to carry on a genetically modified human gene pool. One survivor of the old days, Snowman (Jimmy), has to explain to these innocents what their world is about. He concocts a myth where Crake becomes a new god. Although Crake tried to modify the brains so that the “bundle of neurons” that make up God are gone, the new generation stubbornly develops a rudimentary religion. Is it possible for humans to build a better future? I have never been swayed by the perverted notion of total depravity; people are quite capable of doing good. Our great ape cousins demonstrate that it is within our genes to produce a harmonious society. Although religions have motivated some extremely noble behavior in the past, they have also introduced heinous distortions of anything of which it might be said “behold, it was very good.” Atwood has offered us a world to ponder seriously. It is a world where humans play God and end up rotting under an unforgiving sun. Perhaps if politicians were more literate and less religious we might be able to counteract our partial, self-inflicted depravity.